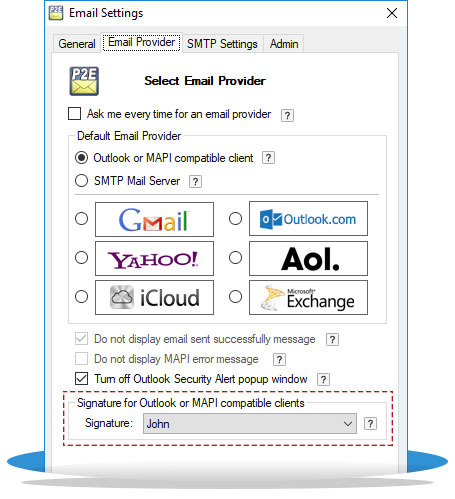 The latest Print2Email comes adds the ability to utilize your existing Signatures from Outlook, or from other MAPI Compatible clients. With the click of one button the new signature feature allows any user to easily use their existing email signatures in every email. The signatures will be imported directly from Outlook or from other MAPI compatible clients. As a result, the signature will be displayed exactly as it was formatted in Outlook, allowing users to take advantage of Outlook's user-friendly interface to create a customized signature for their emails. In order to use your signature in the outgoing emails, select the appropriate signature from the dropdown list, and press OK to save the changes. 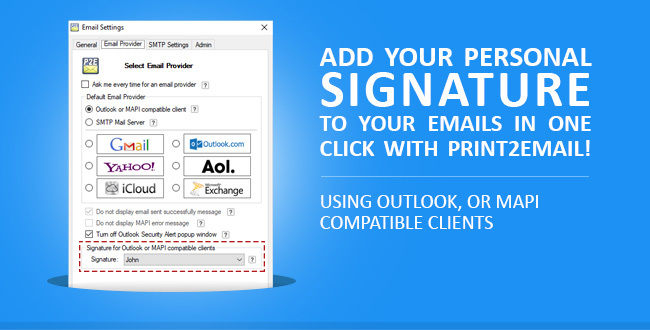 If you do not see any signature in the dropdown list, please make sure that the signature is added in Microsoft Outlook. For more information, please refer to the following section. From now on, the selected signature will be added to the end of every outgoing email from Print2Email.